The British Department for the Environment, Food and Rural Affairs, otherwise known as DEFRA, have announced some changes to their rules governing pet travel abroad. The changes, which cut waiting times after vaccination and do away with mandatory lab tests and tick treatment before travel, are being welcomed by thousands of British animal lovers who take their pets on holiday to France (Holidays in France), or who have made a permanent move to live in France (Living in France) but want to return to the UK with their pets on occasion. The new rules are to be in line with the general regulations currently operating throughout Europe, and will take effect from January 1st, 2012. Ireland, Malta and Sweden, the only other EU countries whose policies on pet travel differed from the rest of the EU, are also changing their regulations along with the UK. DEFRA's new rules make provision for pets to travel to the UK from non EU countries, but only if these countries are listed as approved. Australia, the USA, Andorra, Canada and Mexico are among the 54 countries on this list. Pets being brought to the UK from non approved countries have to follow a different set of rules. The full list of approved countries and regulations can be seen on DEFRA's website at the end of this article. The new rules are seen by most as a necessary and long overdue updating of the system, which was cumbersome and costly. The old quarantine system which required all pets coming from outside the UK to spend six months in quarantine kennels at vast expense and causing misery to both pets and owners, was all but replaced some years ago by the UK's pet travel passport scheme, but this too has become ripe for change. The big changes that will impact on pet travel between France and the UK, are that the whole process will become far less time consuming as the waiting period after vaccination against rabies is to be reduced to just 21 days, and the requirement for a blood test to prove that the vaccination has taken effect is to be removed. It will also no longer be necessary to have a vet administer tick treatments before travel. These moves will also reduce costs for pet owners, as there will be less visits to the vet, less products required and no laboratory analysis to pay for. All pets entering the UK will, of course, still be required to be vaccinated against rabies, a precaution which has proved highly effective for many years, and the actual risk of any animal bringing the disease to the UK will remain minimal, according to Chief Medical Officer Dame Sally Davies. Extensive scientific research has been carried out prior to making the proposed changes, and this is reflected in the new rules. DEFRA have issued clear and concise guidelines for travelling pets, and these can be seen on their website (www.defra.gov.uk/wildlife-pets/pets/travel/). 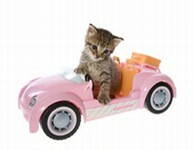 It is important to note, however, that until the new rules come into force in January 2012, the old rules will continue to apply, so if you are travelling before that date, please do not assume you no longer need blood tests, tick treatments etc as you will not be allowed to travel your pet if you do. Information provided here may supersede some of the information given in this article. Am I correct in thinking dogs can travel straight away from the UK with their passports and rabies jabs to France but cannot return for 21 days or after to the UK? Thanks for contacting us. I have been in touch with my colleague Joanna who says that dogs can go to France at any time if they have passports. And as long as the passports are up to date, rabies jabs done in the correct time limit (ie: within a year of the jab, not an hour over) and the worming done and correctly recorded (time and date) by the Vet, they should be able to return to the UK at any time. But if you have any uncertainties I would suggest you contact DEFRA. Hi - we are moving to France and will be going from Portsmouth to St Malo. Can we take our cat with us, are there facilities on board for the cat? I don't like to leave him in the car for the journey and he won't want to travel in the cabin with us. Thanks for contacting us. I am not sure which company you are using, but I was under the impression that either you normally would leave your pet in the car, or take them with you, while on board. I was not aware of there being any facilities for animals which are travelling with you, on board many ferries. However I would suggest you contact the company you are using and check this with them. What are the rules and paperwork needed in taking a dog into France... just one way no return? Thanks for contacting us. Our above article together with our article "Travelling to France with Pets" (http://www.frenchpropertylinks.com/essential/travelling-with-pets.html) should help you. You can also get advice from your vet, as well as DEFRA (www.defra.gov.uk). I am planing to take my cat to live permanently in France but despite all the research it is still not clear what is the procedure. Does he need a rabbies vaccination, or is this only for dogs? What other vaccines are required? I have some information but not enough. Can you please help me with this issue. Thanks for contacting us. 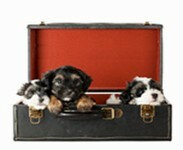 As mentioned above, our article "Travelling to France with Pets" (http://www.frenchpropertylinks.com/essential/travelling-with-pets.html) should give you more information on this. But essentially I would suggest you go and see your Vet, as they should be able to advise on what you need to do in order to take your cat to France. I understand you will need the cat to have its normal vaccinations up to date, also to have a rabies vaccination, a micro chip and an EU Pet passport. You could also check with DEFRA (Department for the Environment, Food and Rural Affairs) who have issued clear and concise guidelines for travelling with pets, and these can be seen on their website (www.defra.gov.uk/wildlife-pets/). Telephone: +44 (0)870 241 1710 - Monday to Friday - 8am to 6pm UK time (closed Bank Holidays. We want to retire to south-west France this year, but we have two horses and seven welsh corgis to bring, horses sorted. We know the jabs and EU passport regs for dogs, but I am getting conflicting info, some say three dogs, five dogs, and three dogs each person. Can you help please? We will bring three in our car and hopefully arrange the other four by pet transport. My Mum and I and possibly my Grandad are wanting to move to France, but we have twelve animals. I read that you can only take three animals per owner, per family - one owner per family. We will not leave any of our beloved pets, has anyone done this? How can you get around this rule? A reply was sent which was similar to the above reply. I am going to France in two weeks' time. My dog has had his rabies shot a week ago and was issued a passport. However he had his yearly shots over a month ago by the Blue Cross mobile clinic. Will I need to get his yearly shots done again for his passport because his passport has not been stamped by the Vet? And does he need a health check a week before he goes? We live in Ireland. Thanks for contacting us. I understand that very little is checked when entering France, so I would think that if you have paperwork for the yearly shots your dog had, and his EU passport with the rabies jab listed, you would be ok. I assume your dog is micro chipped? It is when you are returning to the UK (and I assume Ireland) that the checks are much more stringent. My brother wants to take his two dogs to France from Guernsey. How is Guernsey treated, as it's not in the EU but not listed as such? Do the UK rules apply? Thanks for contacting us. I'm afraid I don't know the answer to this, though I would think the UK rules should apply as there are no regulations/requirements when taking pets between the Channel Islands and the UK. But looking at the UK Government website (https://www.gov.uk/take-pet-abroad), there is a section which says what is needed when travelling into the EU from an unlisted country, which may apply to Guernsey. It says the dogs need a micro chip, rabies vaccination, blood test, tapeworm treatment, vet certificate if not a pet passport, and they must use an authorised carrier and approved route. I would suggest your brother's best bet is to contact his Vet to check this out and DEFRA. Sirs, I am British, residing in France. I am endeavouring to check if it is still a requirement to register dogs with the local police. I have a KC registered pedigree Staffordshire Bull Terrier (six months old) and seek confirmation regarding the need to register, rather than make a fool of myself by arriving, uninformed, at the Mairie. I did register my late (lamented) Stafford but this was nearly ten years ago and possibly the legislation has been amended. Your clarification would be appreciated. I do think it may still be necessary to register your dog, though not sure it is with the police, so would suggest you confirm this with your Mairie, perhaps by telephone before arriving with the necessary documentation. Yes, I agree, the most sensible course of action would be to check with our local Mairie with regard to registering our puppy. I contacted you on the off chance that regulations may have changed. Ten years ago I did register our previous dog with the Municipal Police and can only think this is a good idea because, should our dog stray/be found and the authorities notified, at least there will be a record of the microchip number together with our domestic address. Many thanks for your help. My dog travelled with us to France, Belgium and the Netherlands in May 2014 and was vaccinated against rabies. It says on the passport that it is valid till May 2017. We are hoping to visit the same countries this summer, does my dog need to be vaccinated against rabies again? Hi - we are planning a permanent move to France in the new year, and just acquired 2 kittens whom we plan to take with us. After reading all I can find still unsure whether Rabies vaccination is compulsory or can we have it done when we get there? They will be up to date with everything else. We were told that because we would not be bringing them back to the UK the jab wasn't necessary. Hope you can advise.